Hi friends..googling refreshing drinks for this summer? if so lets have a simple refreshing summer drink today, a traditional drink of South India. Yes.... spiced butter milk / sambharam / Moru . Its hot outside and of sure we feel the need for a refreshing summer drinks. We love to have some good coolant and here it is. A quick thirst quencher and a great body coolant ever. 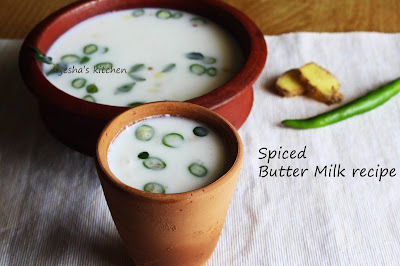 This spiced butter milk is the best summer drinks recipe in South India (Kerala). Butter milk refers to a number of diary drinks. Actually the traditional butter milk / Moru is the liquid left behind after churning butter out of cream. When spices are added to this plain butter milk and served chill, nothing more is needed to beat the summer heat. All u need is some chilled curd, chilies(less hot), ginger , curry leaves and salt. So simple and quick thirst quencher recipe. It is one among kerala onam sadhya recipes too. So let see how to make spiced butter milk / pacha Moru. Add water to the thick curd and whisk it well or can use grinder instead. Set aside. To this add chopped curry leaves, ginger and finely chopped chili. You can also crush them together before adding (i just added instead )..
Now add salt and whisk well. You can strain it and drink ..if required only. And can add more chilies as per your spice level.